What a whirlwind! 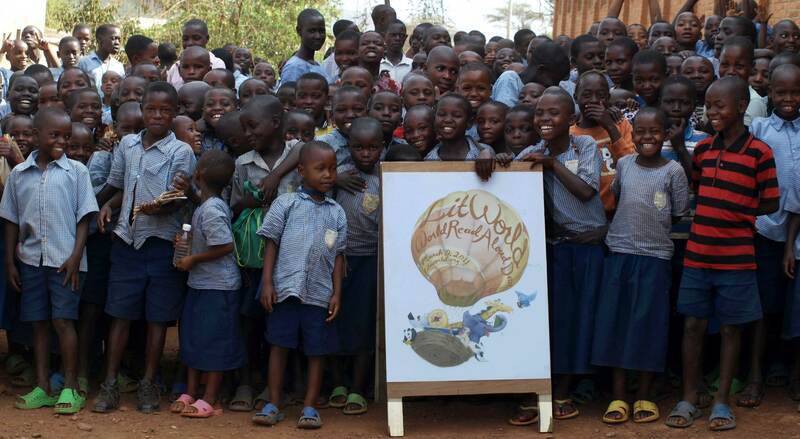 This was our first year participating in LitWorld’s World Read Aloud Day, and we decided to visit each of the five schools in the Rwinkwavu area. 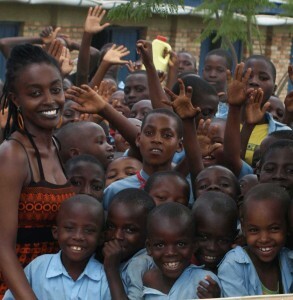 Rwandan pop star Shanel volunteered her time for the day to read to the students in Rwinkwavu. The kids were extremely excited for Shanel’s visit and as we approached each school children standing along the side of the road were screaming, “Miss Shanel, Miss Shanel” eager for her to look their way. We chose a Kinyarwanda story from Bakame, a local publisher, called Kageni by Augusitini Gasake and illustrated by Feligisi Seminega. The kids were captivated by the story and it was incredible to watch the sea of happy faces turn like dominos to see the pictures. At one point in the story, a bird sings “zwi, zwi, zwi” and the children had so much fun tweeting along. The students and teachers at Nkondo One were well prepared for our visit. We were escorted into the school’s beautiful courtyard. All of the students marched in and sat under the trees for story time. Four of the students had prepared an English story to read to Shanel. They proudly stood in front of their classmates and took turns reading. At each of the schools the teachers thanked us and said that it was so nice for the students. Inevitably, the conversion would result in the teachers asking for more books. It was fantastic to be able to tell them that in one year we will have a library full of books along with boxes of books to lend to each of their schools. What a great day! Ready for Reading seeks to empower the Rwinkwavu community through literacy, technology and life skills, enhancing academic, social, cultural and economic opportunities for both personal and community growth and enrichment. Ready for Reading (RfR), a small nonprofit organization built and recently opened the 7800 sq. ft. Rwinkwavu Community Library and Learning Center in Rwinkwavu, in the Eastern Province of Rwanda, Africa serving a district population of 21,000 in a catchment area of 225,000. The RCLLC is founded around sustainability, literacy and community as a center of opportunity, hope and healing, and was designed with the intention that the Rwandan people run it, use it and thrive in it.